Lawyer leads are prospective claimants who have indicated an interest to speak to a legal advocate, law firm, or attorney based upon a legal situation or incident. An attorney lead generation company is a third-party entity that attracts these prospective claimants. On Point Legal Leads engages in legal lead generation – with a focus on personal injury case leads – for law firms across the country. To achieve the most success when attracting and converting potential clients, there are a number of tasks that law firms should consider. based upon a legal situation or incident. Many of these tasks are provided by our automated marketing and remarketing platform, and we are rolling out upgrades frequently to add to our suite of marketing methods. These upgrades typically are geared to increase conversion rates. There are many strategies advertisers pursue when generating lawyer leads for attorney lead generation. Below we will describe what are widely believed to be the top three: pay per click, social media, and search engine optimization. The most popular strategy third-party advertisers use to generate legal leads is pay per click advertising. PPC law firm leads is a form of digital or online advertising in which an internet user sees impressions of text or display ads that, when clicked, drives the user to a website or landing page when the ad is clicked. The most popular platforms for PPC include search engines like Google, Yahoo!, and Bing. These platforms procure ads on an auction basis where many factors determine the highest placement, such as price and Quality Score. The attorney advertiser is charged every time a user clicks the ad regardless of the number of impressions that were served. Hence, the charge is not like a billboard that typically has a flat-fee per month regardless of the number of eyes that see it. Whereas PPC, a charge is incurred only when a user specifically engages with the ad and wants to see more. Generally, there are two types of online ads, or impressions as they are called. The first type is a search-based ad that is based upon a term or phrase a user types into a search engine or browser. The second type is retargeting or remarketing-based, and is served as a banner or graphic advertisement after a user has landed on a website. That website gathers the user’s relevant information in the form of cookies, then follows a user as it navigates to different web pages. Search engines are a good source for lawyer leads and attorney lead generation. 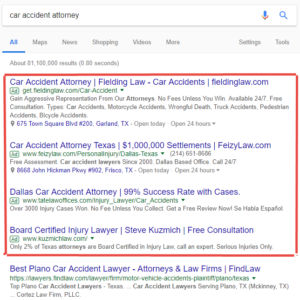 The ads within the red box are impressions shown from the search term “car accident attorney.” As mentioned, the order is based upon the highest amount an advertiser is willing to pay . . . and other factors. With Google, your placement is not solely based upon price. In fact, Google’s cost for the number one ranking position is based upon the number two position’s bid price. But a legal marketer is still going to bid a higher amount to get a higher position, generally speaking. They also have to consider quality score factors that include page speed, relevance, and other elements of a website. If a user clicks on your text or display ad, they will land on your website page as indicated in your ad, and your firm is charged no more than the bid price. For example, if you bid $100.00 for the keyword “car accident attorney,” and that is the highest bid, your ad likely will show up in the top two ranking positions. If 100 users click your ad, then you likely will rack up $10,000 in ad fees. If you are interested in assistance with PPC budgeting, check out this article. One of the most important benefits PPC ads offer is the timeliness of results. Quite simply, you can setup you campaign and generate leads virtually immediately, or at least after approved by the platform. If you have done your research and serve well-written ad copy based upon niche key phrases, you very likely will see traffic shortly after the ad begins being served. PPC Advertising Provides Fast Results. When using digital marketing platforms like Google, Yahoo!, and Bing, you can see traffic the same day, often within minutes. PPC Advertising is Flexible. Compared to traditional advertising like television, radio, billboard, and print, you have a tremendous amount of flexibility on who, when, and where your ads display. You can target former website visitors, certain times of the day and week, and do so on the fly. No more waiting for one ad to take its course. With PPC, you can make adjustments without waiting for an entire week or month’s worth of data to arrive. PPC Advertising Can Be the Most Economical. PPC ads often provide the most benefits to marketers who serve highly targeted ads. The reason is the return on marketing dollars is highest because the conversion rates are directly proportional to the degree of targeting involved. Long-tail keywords allow opportunities to engage with people looking for specific products and services that will meet a need or desire, or solve a problem. Hence, the more targeted the more cost effective. PPC Advertising Can Be the Most Efficient. Because PPC is flexible and economical, it can lend to increased efficiencies. For example, the more focused your ads are in terms of solving specific problems or allowing certain benefits for certain people, the higher your conversion rates. Hence, less time will be spent selling your product or service to prospects who are not as strong a fit relative to those who you had in mind when developing it. Overall, the high degree of target marketing provided by PPC ads lends to increased efficiencies. Social media has exploded into our lives over the past decade. Over time, many changes have occurred, including who uses social media and how often. According to We Are Social, 3.296 billion global social media users existed in 2018, which equates to 42% market penetration. If you’re reading this, likely you have one too. As far as social media goes, Facebook currently is widely known as the crème de la crème of attorney lead generation. It is important because it has a daily active user base of 1.13 billion, with 1.03 billion of those registered as mobile users. Generally, there are two ways to generate legal leads with Facebook: LeadsPages and Landing Pages. LeadsPages. This is a tool offered within Facebook that allows users to input their name, phone number, and email address. Legal leads are generated when a user clicks on a sponsored ad or post and that takes them to one of many templates that are used for lead magnets, webinars, etc. But the information is limited. For more detailed information beyond the essential contact data, consider landing pages. Landing Pages. This is really not a Facebook tool. This simply refers to using your own landing page website in lieu of LeadsPages. So, rather than driving visitors to a Facebook template that has limited data gathering capability, you can drive a visitor to your own site with custom filters. Notably, there are a number of ways to drive lawyer leads to your preferred method. Below we will focus on different posts that you can utilize to engage attorney lead generation. A compelling image that is properly optimized for required size parameters that include accurate graph tags to your website. Design custom images rather than stock photos. Savvy marketers can design or outsource custom images through PowerPoint that include details of the offer. Make the subject and title compelling, which will improve the number of click-throughs. Think about what problem you may solve or appeal to visitors’ fear and greed, both which are known to drive leads. Include a call-to-action (CTA) within the post, preferably towards the top. Place anchor text in your CTA’s that reside around the introduction of the blog. Hubspot conducted a study and found CTA’s with anchor text generated between 47% and 93% of leads from blog posts. Link Captions to Landing Pages. Posts on Facebook witness 3 x additional engagement than those absent images. Take advantage of the high engagement rates by adding links to your image descriptions on your website. This is especially important for profile pictures and cover photo descriptions. Links are important for all pages since it allows users to get a feel for what your company does and how it could benefit them. Use Videos. Facebook prefers video content over images. In fact, there is a 135% higher organic reach than posts with only images. Additional motivation to use videos includes Facebook’s organic algorithm changes; organic reach of photo posts have dropped significantly over the year, and in 2016 alone it dropped 52%. Videos reduce the effect of these algorithm changes And don’t forget to add a verbal CTA in the description of the video, both towards the beginning and end. Use Facebook Live. This is one of the newest features offered by Facebook. It is a live video platform that allows people to broadcast videos from their smart phone directly to their News Feed. Engagement on Facebook Live cannot be understated, as people comment ten times more on this platform than other videos like on YouTube. And like the strategies above, make sure you include a verbal CTA (and written if possible). But you will want to consider repeating the CTA’s throughout the feed because many users will begin watching after it starts. Add a CTA to the Facebook Page. This is among the most important strategies marketers employ to generate law firm leads. This feature was added back in 2014, and it allows page owners to add seven stock options: “Contact Us,” “Watch Video,” “Sign Up,” “Shop Now,” “Book Now,” “Use App,” and “Play Game.” The specific one chosen will display at the lower right-side of the cover photo, which is the standard location for CTAs. See the image below. Increase conversions of law firm leads by proper placement of your call to action (“CTA”). Boosted Posts: This method allows attorney advertisers to convert a standard Facebook post into an ad by “boosting” them. This tactic allows you to reach more organic users and allows targeting based upon the communities data. Right-Hand Column Post Ads: This strategy capitalizes on less expensive ads that shows impressions on the right side of the Facebook News Feed. You may have less reach, but may have more advanced testing options. News Feed Ads: This strategy is widely considered to provide the highest rate of engagement compared to the first two options. As expected, they tend to be more expensive. These ads appear within a person’s News Feed, and considered to be “dark posts,” which means the ads don’t truly get published within a user’s News Feed. Run Lead Ads Campaigns. In 2015, Facebook began offering lead ads that allow users to submit basic information, like name, email address, phone number. And, this could be achieved without being driven away from the platform. This was highly beneficial for generating leads from mobile users, especially since Facebook could auto populate some of the fields. Essentially, a user clicks on a lead ad and a web capture form opens with the user’s contact information that was shared with Facebook. So, all the user has to do is review, edit, and click the submit button. For the business page owner, creating these pages is quite simple: design your ad, determine your target market and corresponding bids, then customize your filters. Ultimately, this is one of the most common means of lead generation for attorneys. Search engine optimization (“SEO”) has become one of the most talked about strategies for generating legal leads. The digital marketing skill, or profession as some might believe, has been around since the late nineties. A few years after the first web page was published, the idea of ranking websites began. Ever since, SEO has been at the forefront of lead generation. Below are strategies to consider when generating case prospects from organic search. Review your current clientele base. Review your competition and the types of clients and work they pursue. Analyze the services you intend on providing. Choose specific demographics of people who would use those services. Evaluate the geographic territory for marketing. Now that you’ve got an idea about your target market, you can use that information to engage in marketing towards that demographic. Keyword Research for Lawyer Leads. This is one of the most important and valuable steps in SEO. Ranking for keywords that generate sales can make or break your online advertising success. The wrong keyword sets could set you back with wasted time and wasted visitors. The right keywords sets could propel you forward with great success. Below are some tasks to consider when determining the best keywords for your website. Use your instincts. Ask yourself what search terms you would consider if in a buyer’s shoes and considering legal representation. Once you do this, consider whether those terms are relevant and a part of your website, especially the tags. Look at your competition. It can be very helpful to see the results of your keyword inputs when gauging your competition. The results can give insight into the difficulty of ranking and how many competitors are vying for position. Also, consider the number of text ads you see, which could be indicative of the value of the keyword. When there are lot of different ads that fill up the ad spaces on subsequent pages, you can be sure the competition is fierce. Conduct a PPC campaign. One hidden secret SEO experts utilize is pay-per-click. The reason is you are able to test different search terms relative to the results. Keywords are often distinguished between “transactional” and “research.” It should be obvious on its fact that transactional keywords like “get a lawyer” or “auto accident attorney” are more popular with users who are ready to make a decision. Use Keyword Research Tools. Sometimes it can be difficult to come up with a solid list of keywords. And, it might be surprising to discover the number of keywords that are powerful yet not included in your original list. Well, thanks to keyword research tools, you can uncover excellent search terms. Below are some you might consider. Use long-tail keywords. Keep in mind that when you start marketing a website for certain keywords, it can take time to get to your top ranking position. 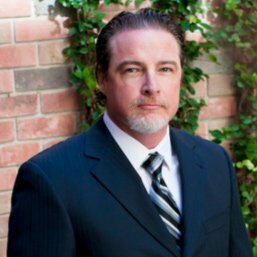 It would be great to rank for car accident attorney Dallas,” but understand that might never happen. Or if it does, it could take a long time. Meanwhile, these popular search terms actually make up less than 30% of searches. The reality is most searches are based upon “long tail” keywords, which are longer phrases, like “how do I locate the best auto accident attorney for handicap drivers in Dallas.” There literally are hundreds of millions of unique searches like this, and often have higher conversion rates because of the stage the use is in the buying cycle. This is where transactional vs. research keywords intersect. Website architecture. This is the structure of you website, most importantly how the pages are connected to each other. To start, think of your website architecture like a pyramid. The top point would be the home page, largely considered the most important page as it defines your purpose to visitors. The next would be your service or product pages. These typically include your services, about us page, practice areas, contact page, attorney biographies, and blog. Under the service or product pages are narrow versions or support pages. On the side would be your blog, which is one of the most important lead generation sources, both in the short and long-term. Below are two important points to consider when designing the structure of your website. Make your home page the nexus. Everything centers around your home page, but don’t think that will always be the page visitors land. Likely, your service pages will serve as landing pages since that is where many, it not most, of your visitors will land. For law firm websites, your practice areas like “car accident injuries” and “slip-and-fall claims” would reside on the practice area page. On your home page, the home link is to the far left, and everything else is to the right. Search engines may see this horizontal description in a vertical world that emphasizes the first link as the most important. And, that is your home page, which is where most of off-page links are pointed towards, especially for branding purposes. Include a blog page. If you want to make the most of your website for organic lead generation, blog pages are a must. These allow new and credible content for visitors, and when linked to other service pages the corresponding ranking improves. with the goal of soliciting an emotion or engagement. Many SEO experts believe that content is the primary driver for organic lead generation. Take a look at what Google believes you content should include. Tags. HTML tags are keywords that are added to a website and are associated with different elements of the page. These are designed to assist search engines understand the website. Below are different types of HTML tags that every attorney lead generation company should consider. Title Tags. These could be the most important to search engine ranking because they are one of the first tags crawling bots review. These tags can be found if you scroll over the website tab on your browser, and they tell search engines the focus of that page. Meta Tags. These tags are second in importance, and provide a brief summary of web page. Typically, one or two sentences long, many experts believe meta tags are no longer included within Google’s algorithm. However, they still provide visitors with a description of your company site. Hence, one of the main benefits is for conversion purposes. But remember there needs to be a connection to the title tag an meta tag so search engines and visitors are not confused. Finally, this is your opportunity to sell, so be sure to use compelling copy! Header Tags. These are like headlines on your web pages and they are inserted within the content. Typically, these are in bold text. There are different types called h1, h2, h3 and go to h6. The smaller the number, the more important. And, best practices suggests web developers use the h1 tag once. Image Atl Tags. These are keywords you use to label your images. So, when they are viewed by search engines they are descriptive of what your site is about. These often are one of the opportunities to increase ranking that is missed by novices. Links. Also called hyperlinks, these can be within your website or from other websites. Links allow users to navigate among different web pages. Also, search engine use the links to determine credibility and authority, as well as discovering new web pages and determining how to rank a site. When they are within your website, you will want them directed to pages you want link juice to flow or used as corroboration for your content. The number and quality of links is important due to the direct correlation between them and ranking position. Larry Page from Google invented PageRank, which is a metric used to determine the quality of a page based upon how many links were pointed to it. Analyze, Track, and Adjust. Once you have completed all your SEO tasks, you will want to review your results after 30 days. Generally, search engines like Google crawl individual sites every 30 days. You may find optimal adjustments based on how certain pages are ranking. You may even find new keywords to consider. Often, and adjustment is made because of the combination of new keywords and recent page rankings. For example, if a company determines that a narrow set of keywords generates high quality and profitable clients, it could make sense to update other pages with related keywords that could provide the same positive results. There are many keyword tracking checker tools that are easy to use and are highly informative. Some of the best can be found from DynoMapper. Law firms can achieve great success pursuing pay-per-click, social media, and search engine optimization when generating legal leads for their firm. PPC is one of the first because it provides quick results as well as feedback about what organic terms your firm may want to pursue. And, you don’t need to spend as much time developing a website because you should be using landing pages, which are websites that are focused around getting only relevant data (not always just biographical or contact information) that can be used to reach out and convert a client. Social media is fast becoming one of the most important and popular means of generating quality case prospects. And, many firms take advantage of the retargeting benefits platforms like Facebook and Instagram offer. Retargeting by using banner ads or sponsored ads within user’s news feeds reminds prospects who have visited your site that you are a viable option to solve their legal issues. Additionally, many legal marketers find social media can be more cost effective. Search engine optimization is often among the last of the big three marketing strategies companies employ. Simply, it can take time for position rankings to rise to the level where prospective clients can find the website. One of the initial items that was not discussed in this article is on-page ranking factors. These include accelerated mobile pages (AMPs) and page speed. Nonetheless, content is commonly considered the number one ranking factor or signal according to many experts. Just remember that quality content is the real king of SEO when generating lawyer leads for attorneys.